And I want to say one other thing. President Trump last month proposed a six billion dollar cut in funding to the National Institutes of Health. And thank God, our Congressmen made a deal last night to not go along with that—they actually increased funding by two billion dollars, and I applaud them for doing it. Because more than 40% of the people who would have been affected by those cuts to the National Institutes of Health are children, and it would have a major impact on a lot of great places, including Children’s Hospital in Los Angeles. Which is so unbelievably sad to me. We were brought up to believe that we live in the greatest country in the world, but until a few years ago, millions and millions of us had no access to health insurance at all. Before 2014, if you were born with congenital heart disease like my son was, there was a good chance you’d never be able to get health insurance because you had a pre-existing condition. You were born with a pre-existing condition. And if your parents didn’t have medical insurance, you might not live long enough to even get denied because of a pre-existing condition. If your baby is going to die and it doesn’t have to, it shouldn’t matter how much money you make. I think that’s something that whether you’re a Republican or a Democrat or something else, we all agree on that, right? I mean, we do. And whatever your party, whatever you believe, whoever you support, we need to make sure that the people who are supposed to represent us—the people who are meeting about this right now in Washington—understand that very clearly. Let’s stop with the nonsense: this isn’t football, there are no teams—we are the team. It’s the United States of America. Don’t let their partisan squabbles divide us on something every decent person wants. We need to take care of each other. 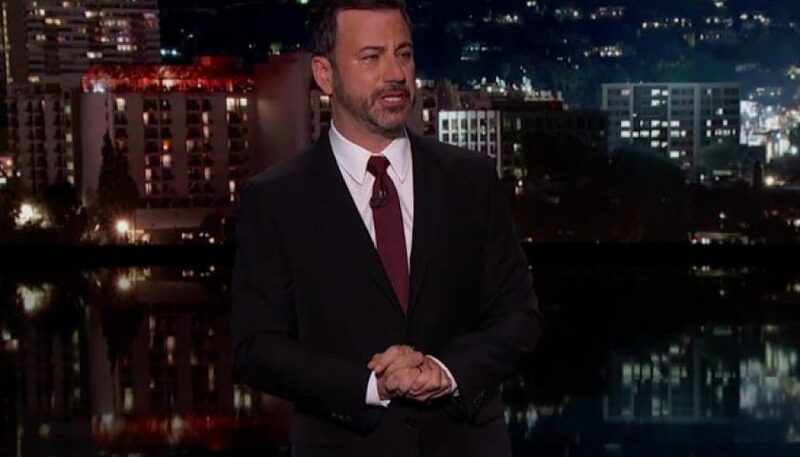 Kimmel moved into full-on crying at this point, adding, “I saw a lot of families there, and no parent should ever have to decide if they can afford to save their child’s life. It just shouldn’t happen. Not here.” Incidentally, I think the sprinkler system in here must have gone off during that blockquote—weird that it was aimed right at my eyes. Kimmel urged the audience to donate to Children’s Hospital Los Angeles; if you’re so inclined, you can do so here.